In my motley collection of handguns I own revolvers chambered for bottleneck rounds. Four of them to be precise. The first is a S&W Model 53 chambered for the .22 Remington Jet. Essentially a .357 case necked down. The bullet is a .222 inch 40 grain JSP. Introduced in 1961. 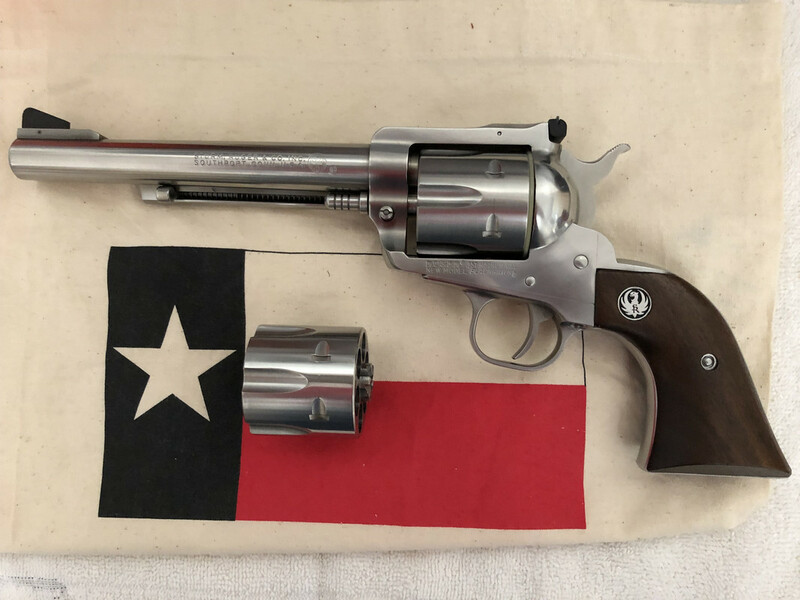 S&W made 15,000 M53's and ended production in 1974. Remington was the sole producer of the Jet round and ended production in 1989. I have a decent supply of cartridge cases and both Remington and Hornady bullets. The M53 required that the chambers and ammo be clean and dry. Otherwise the case would set back against the recoil shield and lock up the revolver. I use rubbing alcohol to remove any oil from the chambers prior to firing. The loaded rounds get a wipe down as well. The second is a Ruger "Buckeye Special" which was made for Buckeye Sports in Ohio, a big Ruger distributor. It is a NM Blackhawk .32 Convertible with two cylinders. The .32-20 Winchester and the .32 H&R Magnum. The .32-20 is an old round introduced in 1881 in the Winchester Model 1873 lever action rifle. Ammo is still produced by Winchester and Remington. Loaded to very mild pressures due to all of the old rifles and handguns chambered for it. I worked up a load using a 100 grain LSWC I cast and Bullseye powder. It does 1000 fps in the 6.5 inch barrel. Recoil is quite mild. Very good accuracy as well. The third is another Ruger "Buckeye Special" .40 Convertible. Two cylinders, one in .38-40 Winchester and the second in 10 mm Auto. Winchester still produces the round with a 180 grain JSP. I chronographed this load at 900 fps. I bought a Lyman four cavity mold for the original profile 180 grain flatnose and worked up a load using SR #4756 powder. It does an honest 975 fps in the 6.5 inch barrel. This duplicates the original load using 40 grains of black powder. The fourth is a S&W Model 544 chambered for the .44-40 Winchester. The 544 is a Model 29 with a five inch barrel. It was produced as the Texas Wagon Train Comm for 1986. Both Winchester and Remington offer an identical load. A 200 grain JSP with mild pressure. I cast the RCBS #44-200FN which duplicates the original lead bullet. Load it over Winchester #231 powder for a velocity of 850 fps. The cylinder walls of the M544 are quite thin and so I keep the pressure down to a safe level. I enjoy shooting the old Winchester rounds in modern revolvers. When I go to my club range with one of these revolvers it attracts the attention of other shooters. Quite a few of them know very little about the old bottleneck Winchester rounds. And absolutely nothing about the .22 Rem Jet. I, too, had to clean the cartridges and cylinder frequently on my Jet when I took it to the range. The same for my Smith 32-20. And, people always ask about them. Back in '77 I wanted to go handgun hunting for deer in Pennsylvania. So I bought a new stainless Ruger Blackhawk in .357 Magnum. 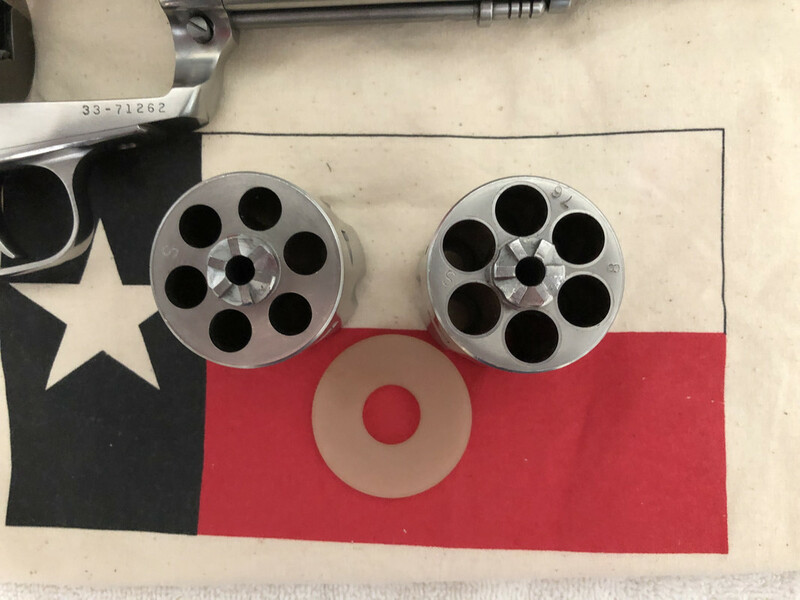 I sent the cylinder off to Bob Booth in Castro Valley California where he machined it for his new wildcat cartridge, the 357/44 Bobcat Magnum. While waiting for the cylinder to return, I sent the frame off to Ruger and had a new .357 cylinder fit. Both the Bobcat machined cylinder and the Ruger new cylinder fit revolver arrived the same day. Now I had a dual cylinder stainless Blackhawk. The bottleneck 357/44 Bobcat cartridge is simply a .44 Magnum necked down to 30 caliber. 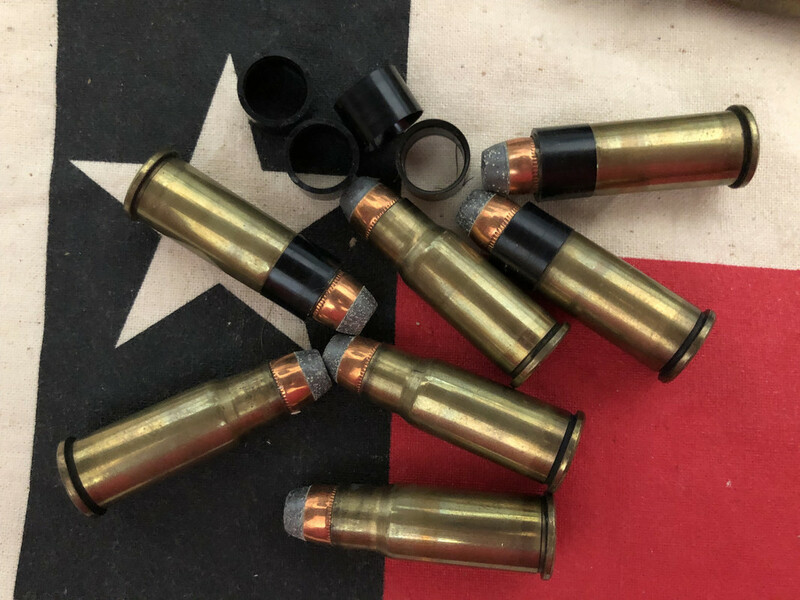 The cylinder is not bottleneck reamed as the cartridge itself requires a collar to be placed around the entire bottle neck taking the loaded cartridge to 44 Magnum dimensions, except for the bullet itself. Luckily I ordered a bunch of collars with the cylinder machining. The 357/44 Magnum ammo is hand loaded to 357 Automag specifications. One load is for a 110 grain bullet loaded over a bunch of H110 giving you 2000 fps out of a 7 1/2 inch barrel. The muzzle blast is absolutely amazing! I never did take my Blackhawk deer hunting because I got sick as a dog during handgun hunting season. Sadly, one of the guys I was to hunt with died from a fall off his tree stand. He broke his neck and died instantly. Last edited by mg34dan; November 23, 2018 at 10:49.
jet revolvers reportedly jammed in function if the cylinders had any oil in them, at all. the cases would set back and expand against the recoil plate tightly enuf to stop the gun. jet guns should have ammo full sized in reloading and be shot dry. loud little fuggers too, sonic boom and all. The M53 I have has the six inch barrel. I chronographed six rounds of R-P factory ammo and it did 1750 fps but with a big velocity spread. My hand load using the 40 grain Remington bullet with H110 powder and a Winchester magnum pistol primer does 1850 fps with the same level of velocity spread as the factory load. I seem to recall conversions to bottleneck cartridges in revolvers some years back. I believe Bain and Davis did one where they necked the 44 mag down to 357 in a Ruger. As I recall the Bain & Davis gun shop out in Kali developed the .357/44 B&D wildcat round back in the late 1950's or very early 1960's. BJ is correct that the first revolvers converted to this wildcat were Ruger Blackhawks. They also would convert a S&W Model 27 and 28 at extra cost. As I understand it, the .357/44 would produce .44 Magnum muzzle energy with the 158 grain JSP bullets available back then. Less recoil, flat trajectory for a revolver round, and there were no reported problems with cylinder lockup. Maybe 30 years ago I was in a gun shop and saw a Ruger .357 Blackhawk with a 6.5 inch barrel converted to the .357/44 B&D. It could be had with formed cases, dies, and a loading data sheet for only $250. I gave it some thought but ended up giving it a pass. I didn't want to get into wildcat cartridges back then and still don't to this day. The late, great Guru of Handguns Elmer Keith(RIP) preached the woes and follies of bottlenecks cartridges in revolvers. As the title states: I would love to have a revolver chambered in .17 HM2. If such a beast was produced and some one has one they want to sell, PM me. I used to read his columns and articles that were published in Guns & Ammo magazine. I always took everything he had an opinion on with a tablespoon of salt. As he got older his BS got worse and worse. He was a great one for taking credit for firearms developments that he had nothing to do with. I don't mean to offend any member of the Files with the above but the "grand old man" of handgunning was full of himself IMHO. Bottlenecks work fine in semi autos and full autos but those guns get rid of the empty as its fired. Cylinder dragging around a spent case that's pushed back would make for difficult shooting. Trigger pull would get harder after each shot. No not for me, I don't own one and favor straight wall cartridges like my 44 specials and 38 special. Don't want a gun I have to screw with to make it shoot. Loaded 200 44 special for the next range session and looking forward to the simplicity and fun of straight walls. For nostalgia or just outside of wanting a companian revolver in a chanbering to a rifle cartridge you already use, like 25-20,32-20,38-40,44-40, I see no good reason. The reason thicker strait wall revolver cartridges were developed in the first place was to safely hold higher pressure and produce greater result than the older, paper thin, low pressure, PITA to reload bottlenecks mentioned above. As for the Jet,,,I cant really think of any use, besides as a dust collector investment.. The only exception being scoped single shots. Don't have one to sell, but Ruger made a Single Six Hunter with .17HM2 & .17HMR cylinders. Much rarer than the .22LR/.22WMR version. The last one I saw sold for $1000 and that was years ago. 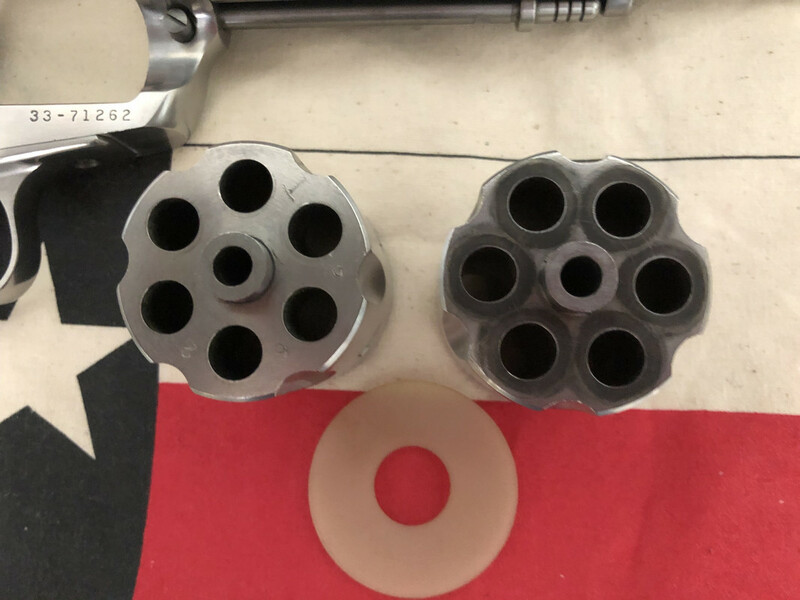 I have never had one of my bottleneck rounds stick in the chambers of my revolvers so chambered. I keep the pressure level down in those Winchester rounds. Never tried to make any of them "magnums". I own revolvers chambered for the .32 H&R Magnum, the .357 S&W Magnum, the .41 Rem Magnum, and the .44 Rem Magnum. These are what I use when I want that higher level of performance. I agree that the .22 Rem Jet never really caught on with many shooters. It was one of those ideas that sound good on paper but lack in reality. Perhaps if S&W had chambered the .22 K-Hornet things might have worked out much better. One of these days before too long I will put the Model 53 up for sale. I have the six chamber inserts for the .22LR and a numbered to the gun factory fitted .22LR cylinder. Included will be the last full box of factory ammo I have, four boxes of never loaded primed factory brass, a set of Lyman dies, and about 700-800 bullets. And 100 hand loaded rounds. It will make someone a nice package if they like having something just a bit different. I don't think I've shot any revolver more than My Model 53 ... but that was with the 22lr cylinder. The 22Jet however is a seldom shot blaster! I have a couple of 32-20s (a Colt and a S&W), 38-40s (Colt New Service & Model P), and a lone 44-40 (Colt New Service) as well as a pair of Marlin carbines in 38-40. Also a Marlin Lever in .256 Win Mag, wish I had the companion Ruger Hawkeye handgun. I was stationed in Germany in 1964 when the kaserne Rod & Gun Club got one of the Ruger .256 Win Mag Hawkeye single shot pistols. I thought it was an odd looking beast. I also thought it would be a hard sell. But one of the men in my unit bought it. There was an old Luftwaffe 100 meter range that had been built to sight in the wing cannons on the FW-190 fighter. The club members used it for firearms practice. I got the chance to fire a few rounds of the .256 in the Ruger. Recoil was mild due to the weight of that 9.5 inch barrel and the Super Blackhawk frame. Muzzle blast and flash were wicked to say the least. The Marlin rifle was called the Model 62 Levermatic. Chambered for the .22 Jet, the .256 Mag, and the .30 M1 Carbine rounds. Every one of them I saw was in .30 M1 Carbine. Universal made an M1 Carbine knockoff in .256 called the Ferret. Thompson Center made barrels for the Contender in all three rounds as I recall. A friend of mine has a 3-D printing setup and we will be looking into the possibility of making the collars. The collars are the Achilles heel of the 357/44 Bobcat since the originals are now 40+ years old and nobody makes them. Who knows, maybe we will be successful. My limited experience with 3-D printing suggests that you may have a challenging time getting what you want that way. What material are the original collars? How difficult would they be to make out of brass? General Electric's polycarbonate alloy # 191. Interesting. How many shots do you get out of a sleeve? What's the indicator that a sleeve is not fit for further use? Splits? Seems like there probably should be a a way to partially form some rifle brass to use as sleeve stock. A few collars split on their first shot, some on the second, but most on the third. I use the collars until they split, then they are discarded. If you use a split collar to shoot with, the case will crack upon firing at the split line. I'm sure new collars can be made from a variety of materials, but I don't have the skill or knowledge to do it. It is my understanding that Bob Booth first wanted to construct the collars from brass, but he thought that would be cost prohibitive. Personally, I think collars could be constructed from short small tightly wound coil springs. They would be easy to install and remove. Plus, they would never wear out. Now I have another pot at the end of the rainbow to search for!! Any machinists who is worth anything should be able to make new sleeves with out much effort. Should be able to even make them a press fit so they don’t come out of the cylinder while leaving clearance for the cartridges to be easily removed. 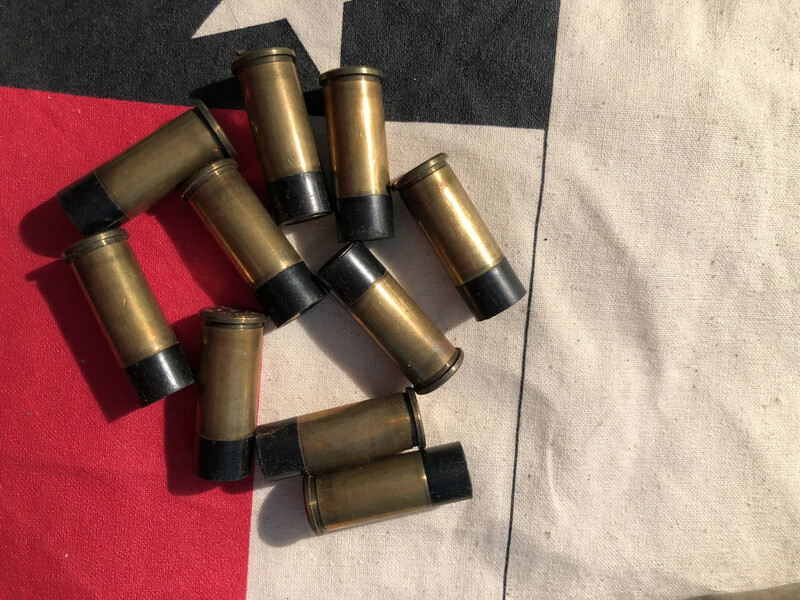 There shouldn’t be too much of an issue with the brass on brass as far as removing the spent cases, but again a good machinists would know which material would be best to use, especially if the machinists knows anything about firearms. metals affinity would be your greatest concern if you have metal sleeves made. You want to avoid surface welding in contact ( a chemical process), which is often referred to as galling, Hence you want two faying surfaces to have a low affinity for each other. Metals of similar chemistry will have that affinity, usually. it's the metals chemistry in terms of electron valence balance that is important, or, what is the static state charge differential? aluminum bronze works well against stainless steel, although beryllium copper doesn't, for chemical reasons. so, you need to know what your case alloy is, and go from there in conversation with a decent chemist. I suspect the ability of the collar to float with the shell contributes to the success of the design. I'm not sure I would want it to be a force fit into the chamber(s). Another reason you'd want the collar to come back out with the spent shell is so that solvents used to clean the cylinder don't corrode the collar into a state of uselessness. Getting it back out would probably require tools. I'm guessing at the dimensions but the collar looks like it could be fabbed from the base of a 308 case. Would be a good way to repurpose a magazine's worth of empty berdan shells. It’s kind of interesting that the topic of bottle neck cartridges has come up. My local internet classified gun site has in the last week people posting a S&W model 53 and a Ruger Blackhawk 38-40 with the 10mm cylinder. The S&W was just under 1k the Ruger just over 1k. The S&W doesn’t have any inserts for it or the 22 cylinder. There was also a Ruger 17 HMR revolver that sold in less than a day too. Just crazy how uncommon these guns are and when people start talking about them they start coming out of the wood work. Neither the Ruger Blackhawk or the S&W have sold yet. The Ruger hunter in 17HMR is the only one that has sold and I don’t know what they were asking for it, it just showed sold for the price. I think what make them desirable is the fact that they aren’t being made any more and also the fact that not many where made in the first place. Also I think people just think their guns are worth more than they really are. That's "The Duke" to you. So Privi Partizan is now producing the .22 Rem Jet round. The price seems quite attractive. I wonder what induced PP to manufacture .22 Rem Jet ammo. There can't be that big a market for it. Or is there? I couldn't tell you. But they do offer a wide variety of ammo and I've been pretty happy with the 38 special brass I've reloaded. I have a serial number matching set of the 32 H&R/32/20 and the 10mm/38/40 convertible revolvers. Both unfired. Need to dig them out soon. I also have a 357/9mm conversion that I had the cylinder rechambered for 357 B&D. I didn't have a chrono last time I took it out, but with a hot load of 296 you didn't have to trim your eyebrows much. If you're going to fight, fight like you're the third monkey on the ramp to Noah's ark and brother, IT'S STARTING TO RAIN! I have a buddy that owns a BFR 22Hornet Single Action Revolver. 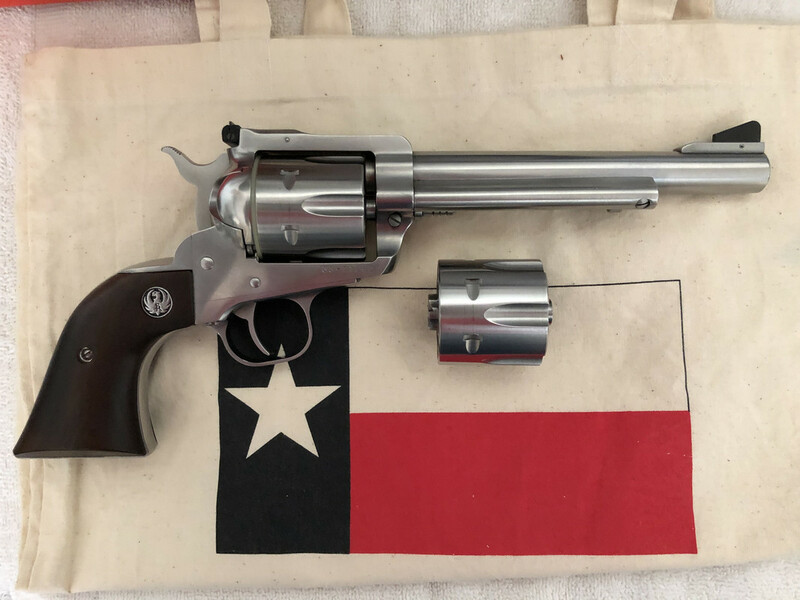 It's Stainless, about the size of a Ruger Blackhawk, with a 7 1/2"(ish) Barrel. He doesn't shoot it much, and thoroughly cleans all his firearms when he finishes shooting, which I presume combined with the low pressure of the cartridge and the mass of the revolver, helps prevent problems.